This article by Jerry Cates, Dawn-Marie Hightower, Staci B., and Ashley A., first published on 3 August 2012, was last revised on 13 August 2013. © Bugsinthenews Vol. 13:08(02). 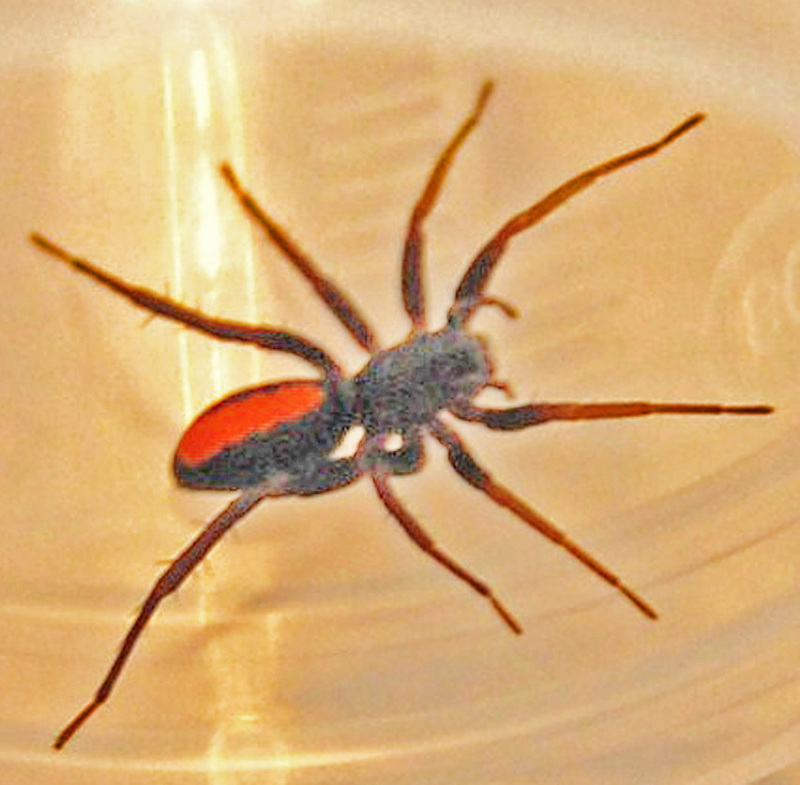 Over the past thirteen years or so, usually during the busiest time of the summer, I’ve received a smattering of photos from BugsInTheNews viewers depicting a black spider, most often with a bright red stripe down the middle of its dorsal abdomen, but sometimes with a small number of red dots at the abdomen’s dorsal posterior, aligned longitudinally. In each case the general morphology of the spider was such that it clearly was not a black widow (which has a shiny, bulbous, almost spherical abdomen), and thus was unlikely to be dangerous. I suspected, however, that — owing to the black widow’s bad reputation and these spiders’ superficial resemblance to it — most people might be moved to quickly destroy them, without so much as a second thought. If so, few if any would be able to provide me with a specimen to study. In almost every case I found myself annoyed at myself once more for not recognizing the spider’s identity outright, and cursed the little time seemingly available to conduct a serious inquiry from scratch. That had always led me to inform the sender that not much could be learned from the photo. The darkness of the spider’s body, and the lighting in which the photo was taken, prevented the kind of character analysis that was necessary to key it to family, genus, and species. But, alas, in every case but one, my plea was for naught. The sender nearly always wrote back that the spider was no longer in custody. It had either been destroyed (the most frequent situation) or released back into the wild. And so the saga continued, year after year, with me still hoping that someone would eventually write back and say “No problem, Jerry, my boy. It’s in a glass jar just waiting for you to come and pick it up.” Well, this year — 2012 — is different. Though two photos of this species, shown above, followed the usual sequence, a third — received after I’d finally identified the species and posted the first two — arrived with the welcome words “I have the spider, still alive!“Photos of that spider are attached later in this article. First, though, we’ll discuss the two photos that preceded the third one, and my reaction to them. The one on the right, found in Round Rock, Texas on 26 July by Staci B. (maddeningly, within a mile or so of my office), was released into the wild before Staci could get back to me. The one on the left, found by Ashley A. in College Station, Texas on 3 August, was pulverized into a misshapen mess by the Ashley’s mother, shortly after the photo was taken. 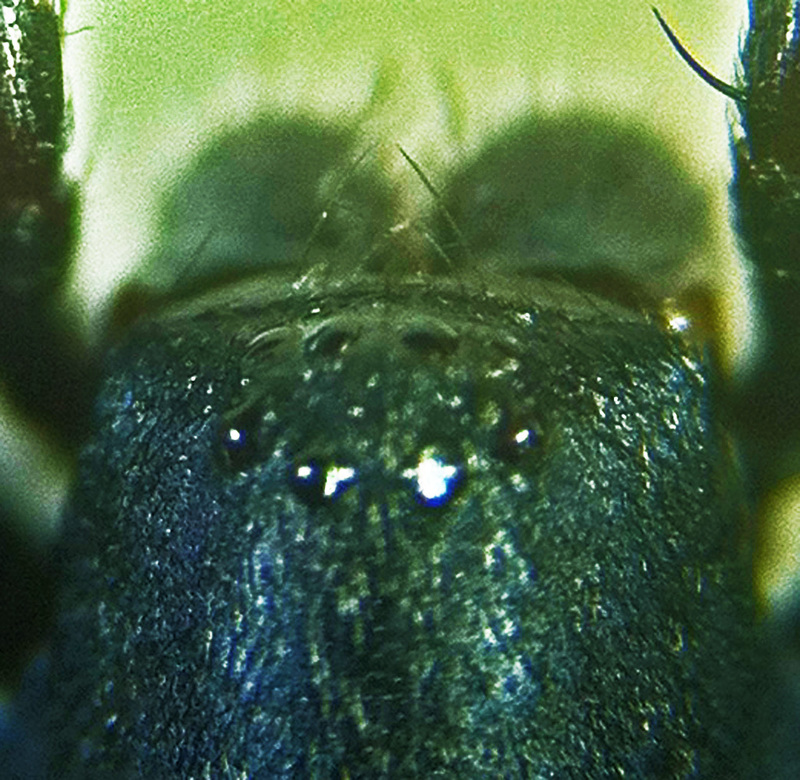 The faces of both spiders are unusually flat, much like spiders in the Salticidae family of jumping spiders. That impression led me to conduct another thorough review of the Salticid literature, which — as before — produced nothing to suggest this species was a member of that family. 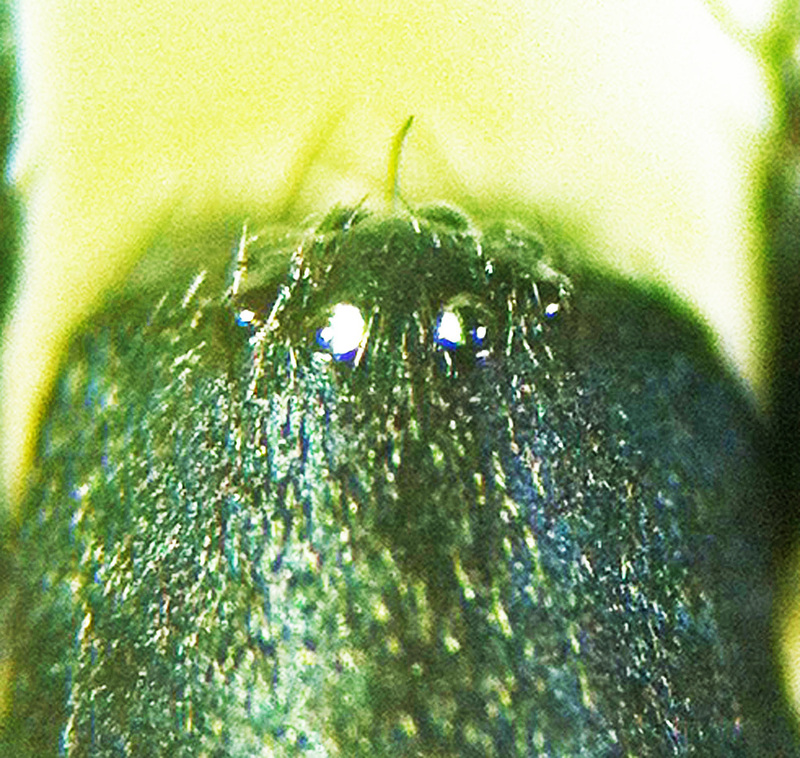 The palps, though not well defined in the spider from College Station, show no signs of being modified distally as are the palps of most male spiders. 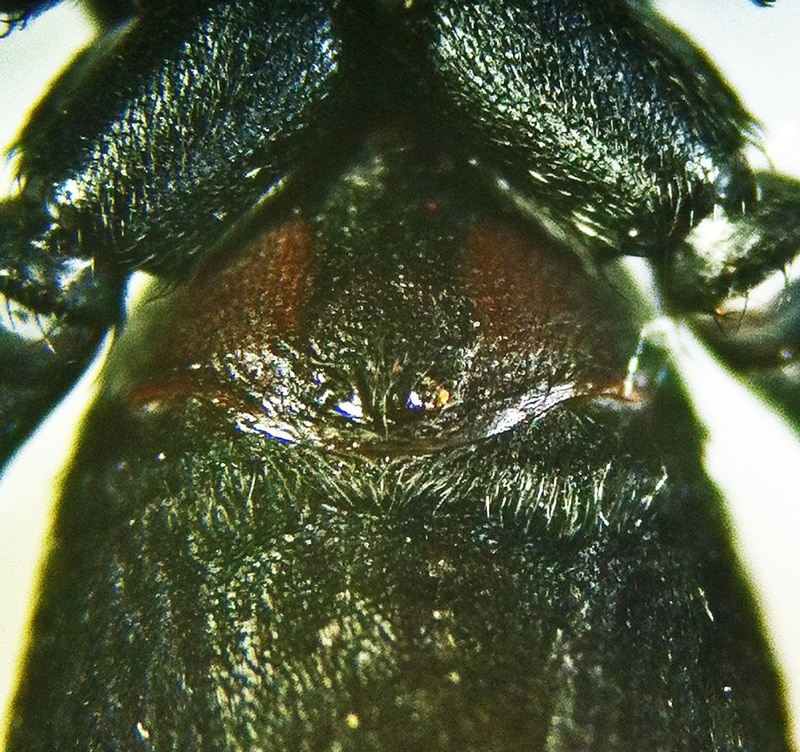 Such modifications are sometimes less noticeable in the Salticidae and in several other families, so this lack is less suggestive that this is a female as that both specimens are of the same gender. Markings often vary considerably between the sexes of the same species of spiders. The carapace is elongated longitudinally, and is about as long and as wide as the abdomen, and these two body divisions are noticeably separated by a “waist”. That’s odd… For most spiders the carapace is either broader than the abdomen or dramatically smaller, and only rarely about the same length and breadth; furthermore, the two divisions are not usually sharply delineated by what might be thought of as a narrow waist. 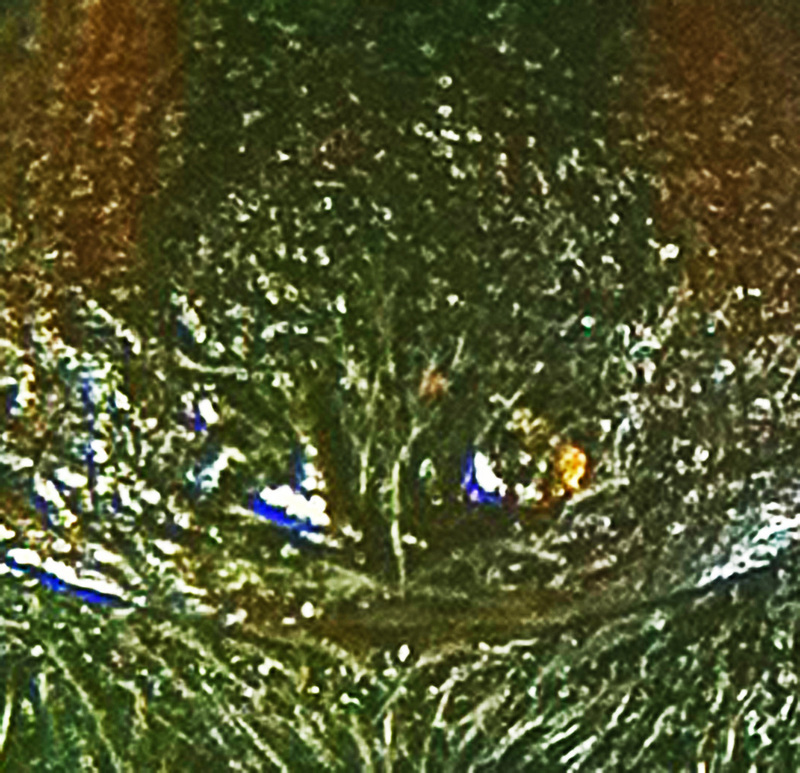 Spiders whose body divisions are similar in size and shape, and whose major body divisions are separated by a narrow waist, are generally considered “antmimics,” for the fact that spider predators mistake the disguised spiders for certain ants and other, similar organisms found in their immediate environment. 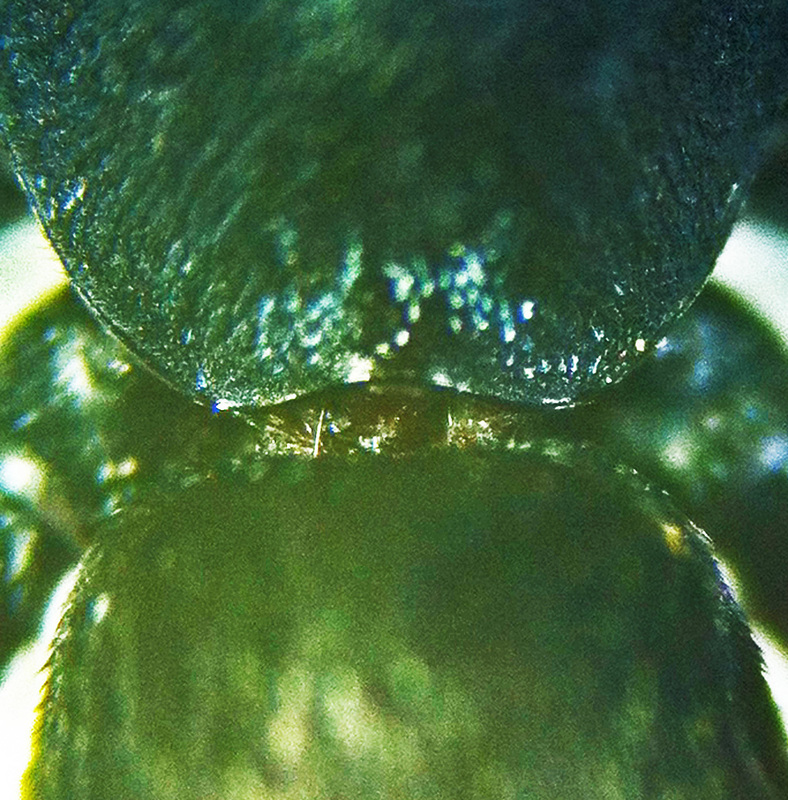 Some Salticid antmimics exhibit these features, but with noticeable constrictions, within the carapace, the abdomen, or both of those body divisions, that are ant-like or wasp-like, and — more to the point — quite un-spider-like. The spider before us, however, retains its spider-like qualities in both the carapace and the abdomen, which is typical of antmimics from another grouping of spiders, those of the genus Castianeira in the Corinnidae family. The red-spotted antmimic (Castianeira descripta), in fact, has a black or mahogany brown body and a dorsal abdominal band of red along its midline. 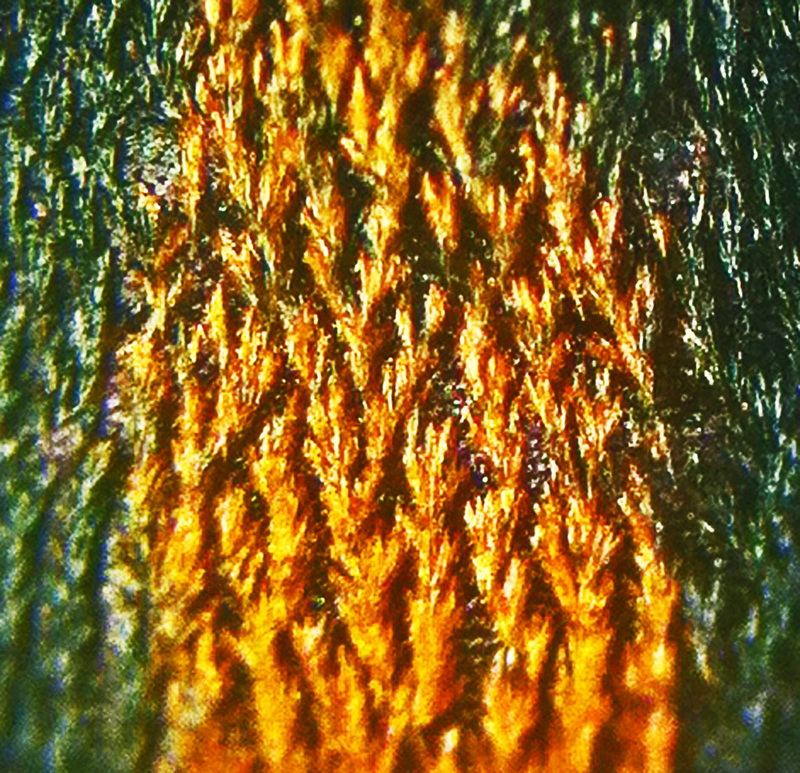 The scalloped edges of the red band pretty much nail our specimen. A close relative — also known as the red-spotted antmimic but with a different taxonomic name, Castianeira crocata, is identical to C. descripta in outward appearance, but has certain microscopic characters of its genitalia that differ enough to distinguish it as a separate species. The distributions of these two species overlap, and both are represented in some parts of Texas. Most of the time, including the case before us with the red-spotted antmimic, when spiders mimic non-spider organisms in their surroundings, the mimicry is Batesian in form. In Batesian mimicry one organism (the mimic) that is harmless to its natural predators — and thus considered a prize morsel of food to them — evolves sufficient characters in its shape, form, coloration, and/or markings to outwardly imitate those of another organism (the model) that is harmful to its natural predators. When the mimic’s natural predators observe those mimicked characters, they mistake them as warning signs of the model. Instead of snatching the mimic up, they pass it by, preferring to eat one of its cousins that is not so fortuitously adorned. This form of mimicry is named after the English naturalist Henry Walter Bates, whose work in the rainforests of Brazil led him to postulate that such mimicry evolves from the ordinary processes of natural selection. Predators seek out and exploit species that do not exhibit any of the warning signs of harmful organisms, leaving a disproportionately larger number of harmless species fortunate enough to serendipitously sport one or more such warning signs. Over time, species of prey that naturally exhibit a range of variation in body shape, coloration, and/or markings tend to produce more and more that mimic harmful organisms, and less and less of those that do not. It should be noted that antmimics seldom fool the organisms they mimic. In many if not most cases — as for example in the one before us — they don’t even fool humans into thinking they are anything but spiders. Kaston (1978) points out that, in fact, the red-spotted antmimic doesn’t actually mimic an ant, but rather a red mutillid wasp. Even so, there seems little doubt that such wasps would mistake this spider for one of their numbers, or that we humans — on seeing such a spider — would think it a mutillid wasp, but that’s not the point. It is sufficient that some of the predators of these spiders (many of them other species of wasps) will be fooled, or momentarily confused, just long enough to cause them to hesitate, or to perhaps even pass this spider by altogether, for the spider and its future offspring to benefit. Infraorder Araneomorphae (Uh-RAY-nee-oh-MOHR-fee) — distinguished from the mygalomorphae by having opposing fangs that open and close perpendicular to the spider body’s longitudinal axis, in a pinching action, whereas, in the mygalomorphae (e.g., tarantulas and trapdoor spiders), which have fangs that open and close more nearly in alignment with the spider body’s longitudinal axis. Ahrens, Lily, and Johanna M. Kraus. 2006. Wolf Spider Movement Along a Pond Edge. J. Arachnology 34:532-539. Brady, Allen R. and Kelly S. McKinley. 1994. Nearctic Species of the Wolf Spider Genus Rabidosa (Araneae: Lycosidae). J. Arachnology 22:138-160. Brady, Allen R. 2007. 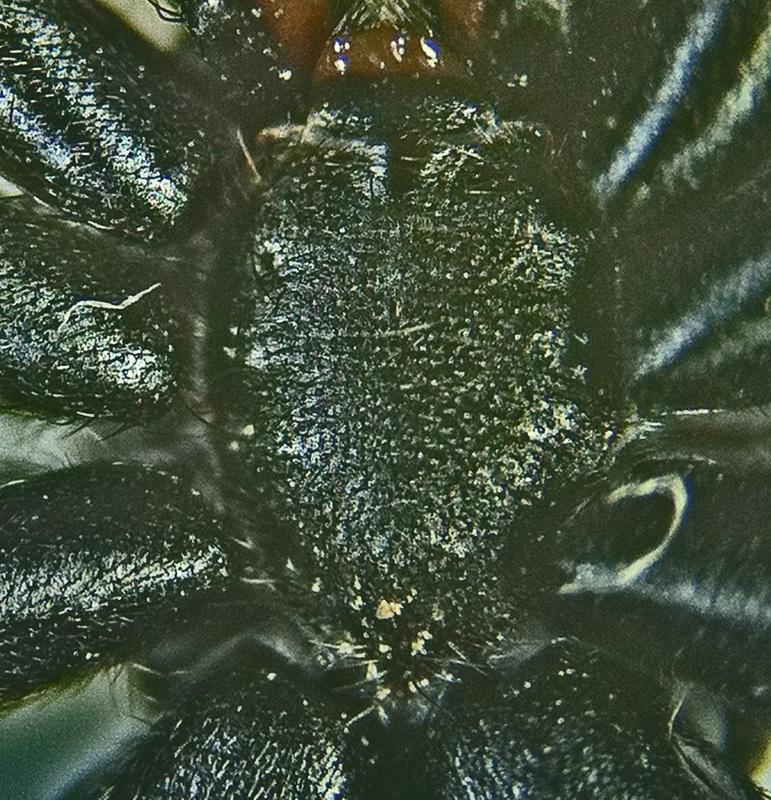 Sosippus Revisited: Review of a Web-building Wolf Spider Genus from the Americas (Araneae, Lycosidae). J. Arachnology 35:54-83. Dondale, Charles D., and James H. Redner. 1983. 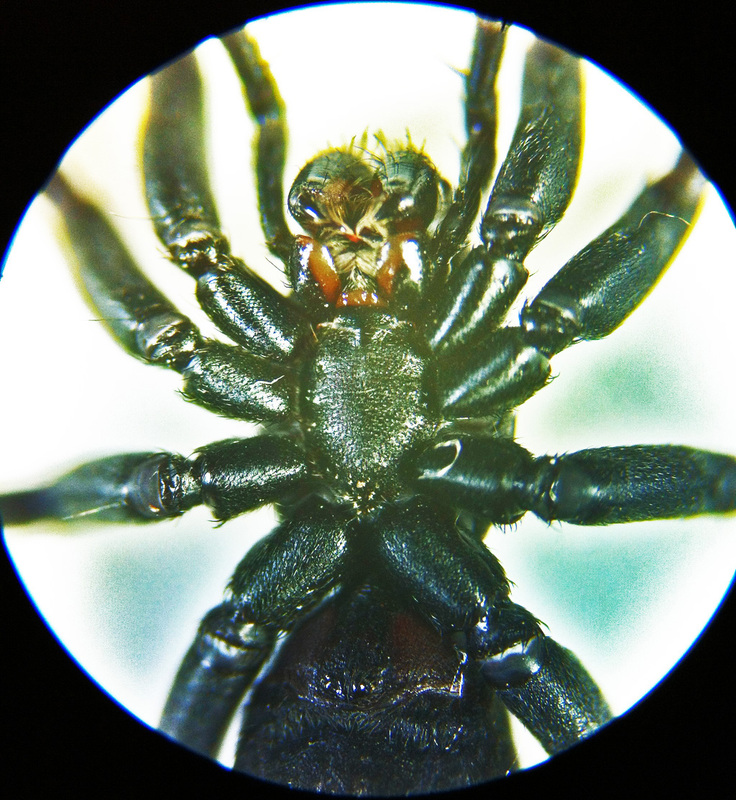 Revision of the genus Arctosa C. L. Koch in North and Central America (Araneae:Lycosidae). J. Arachnology 11:1-30. Dondale, Charles D. 2005. Chap. 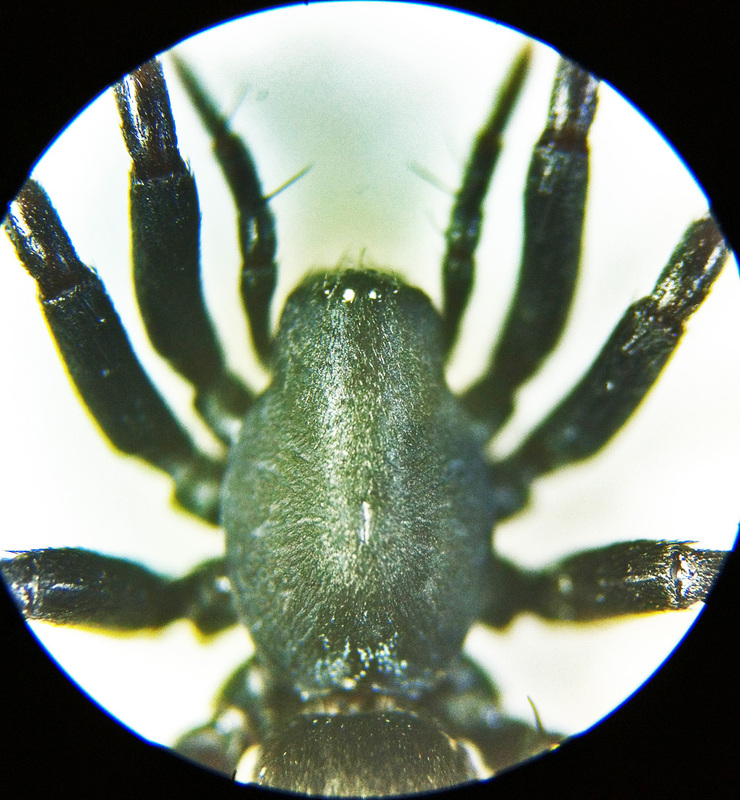 37: Lycosidae, in Ubick et al., 2005, Spiders of North America: An Identification Manual . American Arachnological Society. Platnick, Norman I. 2012a. The World Spider Catalog, Version 12.5; FAM. CORINNIDAE Karsch, 1880c: 374 [urn:lsid:amnh.org:spiderfam:0049]. American Museum of Natural History. Uetz, George W., Jennifer Bischoff, and Joseph Raver. 1992. Survivorship of Wolf Spiders (Lycosidae) Reared on Different Diets. J. Arachnology 20:207-211. Vogel, Beatrice R. 2004. A Review of the Spider Genera PARDOSA and ACANTHOLYCOSA (Araneae, Lycosidae) of the 48 Contiguous United States. J. Arachnology 32:55-108. I have just discovered one of these red spotted ant-mimic spiders running up the wall behind my computer station. Sadly like others in your article I mistook it for a Black Widow and quickly dispatched it due to having four young children in our household. After I did so I noticed that the strip was on the wrong side and quickly began researching what kind of new spider I had seen. I live in Jacksonville, NC. USMC Base Camp Lejeune to be more precise and was just wondering if it is normal for them to be this far east and or north since in your article they were all in TX. I just killed FOUR of these in my house and I live in Michigan. Are these normal for here? Just found found a spider of this type in Lubbock, Texas and added it to my arachnid photo collection… He’s still alive but I will be turning him loose soon so email me at troyandrandicarnley@yahoo and ill mail him to you. And he’s fairly large …. Hi! I just found one of these in my house (new construction) and stumbled across your website while trying to identify it. I have it in a ziplock bag if you want it. I I think it’s dead but it’s still intact. My mother in law picked it up with a paper towel and I snagged it before she smooshed it good and threw it away. I want to know what’s crawling around my house since I have small children and dogs around. We just moved to Round Rock, TX and I have never seen so much spider activity in my whole life! Just the other day I found a dead brown recluse in my washing machine! Ah! I wasn’t expecting so many spiders in a brand new house but I guess that’s what we get for disturbing their habitats! They aren’t just in Texas… I just killed one in Western Wisconsin. It’s dead, but if you would like it I will save it and send it to you for comparison. Sorry, Rebecca, for implying these spiders are confined to Texas. I meant, by that title, that the specimens I was reporting on were — at the time — all collected in Texas, but yes, they are found all over. In honor of your comment, I’ve changed the title to avoid confusion regarding their distribution. Gosh, I wish I had time to examine all the red-spotted ant mimics everybody is offering to send me, but I don’t… Thanks for the offer, though. And keep on studying the spiders around you. They are a fascinating group of organisms. I think we just found one of these at work. I took a picture and tried to compare it with spiders online and this one came up. I knew it wasn’t a black widow. If you ever feel up to viewing the pic I can send it anytime. Thanks for thw page! I’m in Louisiana. We are in Twin Falls (southern) Idaho (45 miles from Nevada – desert climate) and haven’t seen this type before. I think I may have killed one of these this morning. I’m not sure that it was an antmimic but those photos match the best. Like many others I have small children so the shoe came to its demise quickly. I know it wasn’t a black widow but I’m not one to be very spider friendly as I was bit on my eyelid as a teen. We recently moved here outside Elko, NV and I’m still trying to learn what can hurt us and which are harmless. I just got bit by one of them 2 days ago on the bottom of my big toe. It has been painful and I’m still sick, I will say they are poisonous. I’m 35 very fit and healthy it drives me up the wall that I feel like an old man, how long will the symptoms last? Hi there. I spotted a similar looking spider out by our outdoor kitchen. From all the pictures I’ve seen, it still resembles the Black Widow the most. Could I send the pictures I took in to you for an identification? Yes i also have one of these spiders in a bottle now and i am in Merango In. my wife has been getting bit by something alot the last few weeks and well we have seen so many kinds of spider in and around our house so i am always catching them so i can learn about them. i seen where one person said they got bite by one and it made them sick. So what i am wondering is what is the symptoms of there bite then please help. We found one of these spiders while cleaning out a garage in Lomita, CA. I can’t find any other references to this spider on the west coast. Has anyone else seen them here. We almost killed it thinking it was a black widow, but it’s still roaming around. Thanks, Arachnaphobe. Just found one of these guys in my house in a small town in Florida. Is there any other info known about them? I thought I read on a different post that they were native to Australia. I am very interested to find out more about them. Thank you for the help. Jerry, my daughter found a whole hatching of spiders on a flower pot on her front porch yesterday. (In Rockwall, Texas) They are very tiny; black with bright red spot. I wonder of these are the spiders you described. Never did see an adult. If not, what kind are they and are they dangerous. We took a picture, will try to send it. Thanks for your help. I found one about 2cm in length in Dallas, Tx. I Have him in a glass jar, he is lively! Please let me know if you want him. I have never seen one of these before. Just found one of these in our home. Screamed like a little girl and smashed it without a second thought. We live in Fort Bragg, NC. Found one of these today in my den. Thought it was a black widow at first because we do have some in our yard. I am usually a capture-and-release type of person but reacted hastily this time. Upon closer examination I realized my error but, by that time, it was too late. I’m 99% sure it is a castianeira crocata. It’s the first time I’ve ever seen one. So sorry I killed it. My daughter and I saw a small (baby) crawling on the ground outside our above ground pool Sunday. She tried to kill it thinking it was a baby black widow, but ended up letting it get away. Yesterday, I looked around and one had fallen in our pool, I am assuming from an oak tree limb that hangs over the pool. It was quite large and my hubby and I watched as it took a swim in the skimmer! We also thought that if it was not a black widow, then it was a distant kin. We are in southeast Kentucky, Harlan to be exact. Hi. I found one living in my compost bin. It doesn’t quite look like the ones in your pictures. Unfortunately I do not have pictures (it scurried away). The spider I saw looked more like a giant wolf spider, tucked its legs in to hide and when it did that I could see it was a little hairy on the back side and definitely had the red on the back…but it was more of a blotchy triangle, not a strip running the length of the back. Mistaken for a black widow in College Station TX a few months ago (like Sept. 2014). Pulverized by my daughter (was in bedroom, being chased by our new kitten, out of fear of bite). We caught a specimin of this spider in my classroom. It is alive and in my principals office. Just holler if you would like another one! 512-992-5564. I live in oklahoma and found one today runnning accross my living room floor. Just collected a specimen from my sink. 8am South Texas. Ganado, TX. Put it in alcohol bottle for future reference. It looks like the first picture. I believe this is the type of spider which I just witnessed attack and haul away a fly on my keyboard. 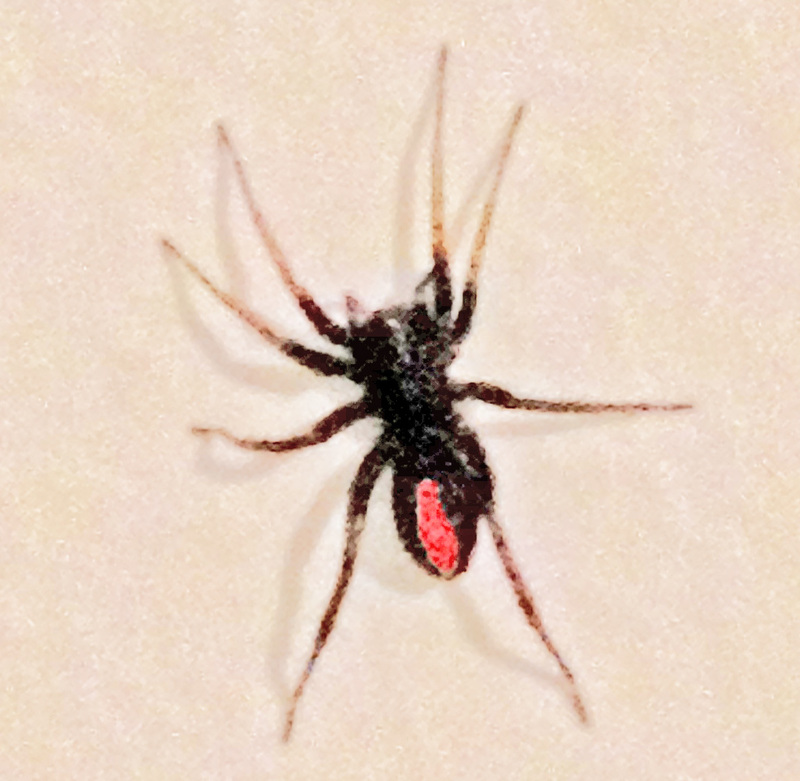 The spider was black, seemed velvety when looked at it closely, and had a red spot near the tail. It was not a jumping spider, though–I have loved those since I was a child and used to play with them–configured more like a widow, but with a narrower and less inflated abdomen. What happened: the fly landed, then flipped over on its back. I thought this was strange, so I took a closer look. To my surprise, a teensy black spider that was smaller than the fly was grasping it from behind! There was a trail of spider silk hanging off two of the fly’s legs–as if the fly had stumbled over a trip wire of spider line. Fascinated, I watched as the spider struggled with the fly until the fly stilled. Then the spider dragged the fly over to where it had left some anchor thread, and proceeded to wrap the fly a few times. 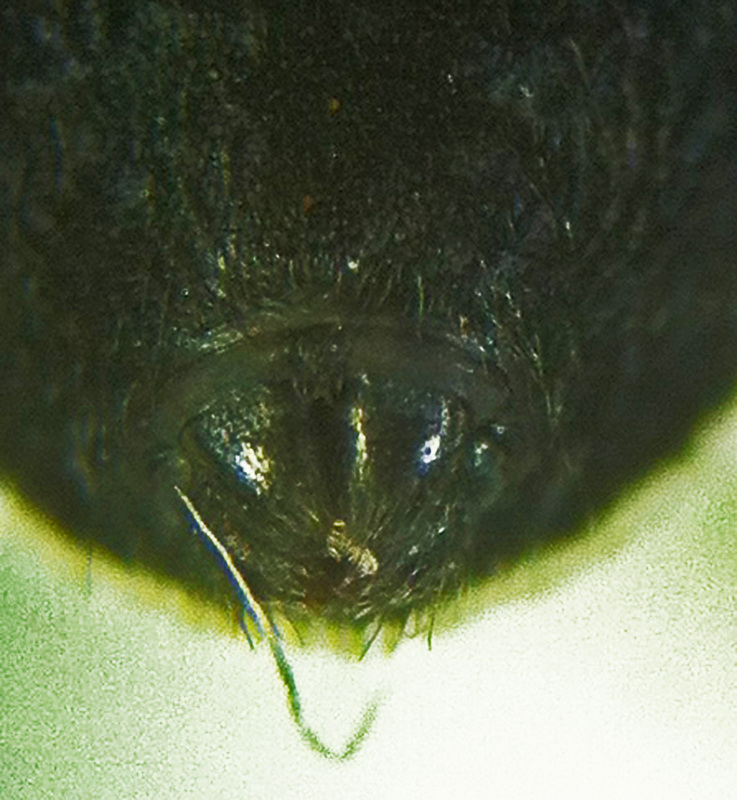 The fly occasionally wiggled enough to tumble the two around on my laptop, forcing the spider to drag it once again to where the thread was anchored. This whole time, the spider seemed to be holding onto the fly with its mouth and at least one leg. The battle to get the fly wrapped up lasted pretty long. The fly looked smaller and smaller, which made me think that perhaps the spider had already been drinking from it, or else I was seeing an effect from being wrapped tighter. The little spider seemed to really struggle to keep the fly from falling into the space between the keys, and it struggled even more with hauling it around. They stayed in a space formed by the hinge for a long time. When they finally came out, the little guy was suddenly able to LEAP with the fly in its mouth! It jumped onto the jumble of stuff next to my desk, then with several more smaller jumps took the fly underneath my laptop. I assume it’s still there. 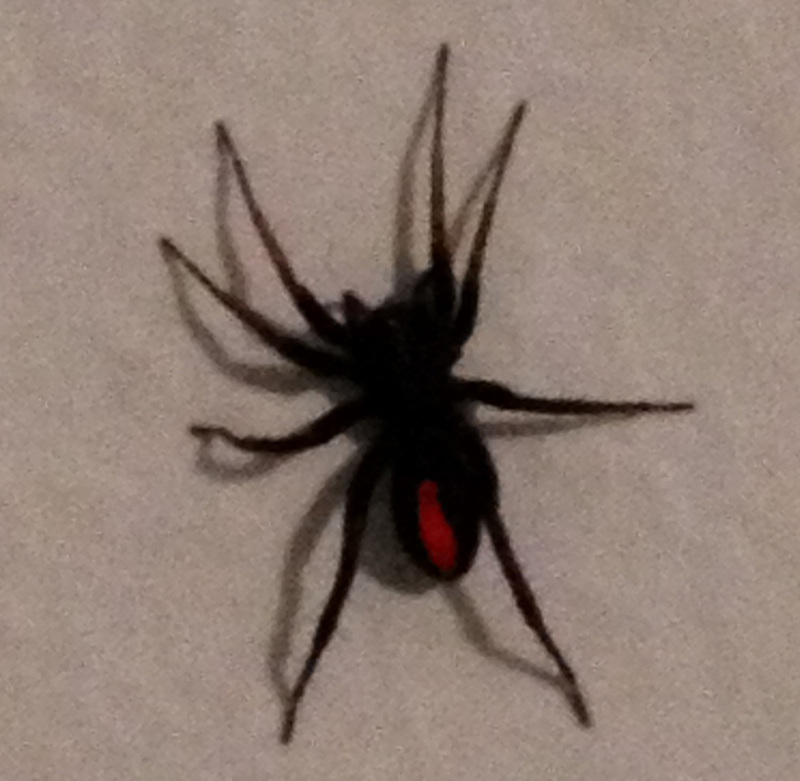 I have been trying to identify the species, because it looked enough like a black widow to alarm me. But it looked more like this Red Spotted Antmimic Spider than anything else I’ve found. I’m in Abilene, Texas. I’m grateful for this site, and especially for this page. Just found one of these running across my bedroom floor- they’re very fast. I got it in a water bottle, as I noted they like to run into crevices and such, so when I got the mouth close it just ran on in. It’s much like the ones above- the microscope one seems very well fed compared to this one, though. I should note that I’m not the type to shake the bottle to see what they do or anything, but when I had my finger on the bottle, it seemed to gravitate towards it- I think it may be either micromovements triggering something or just the warmth of my finger. It seemed aggressive at first, but settled down after a few minutes- I think it was likely just actions as a defense mechanism, rather than any particular issue of an aggressive spider. Very bold, though, no real fear of me, more of a mild annoyance with the bottle it was in- It kept climbing around, looking for a way out. I was wondering where I could send an image to, i found something similar in South Africa, although not identical. I am unable to find any info on it. Send the image to me at entomobiotics@gmail.com. I have an extensive library on spiders and will do my best to identify the one you photographed. 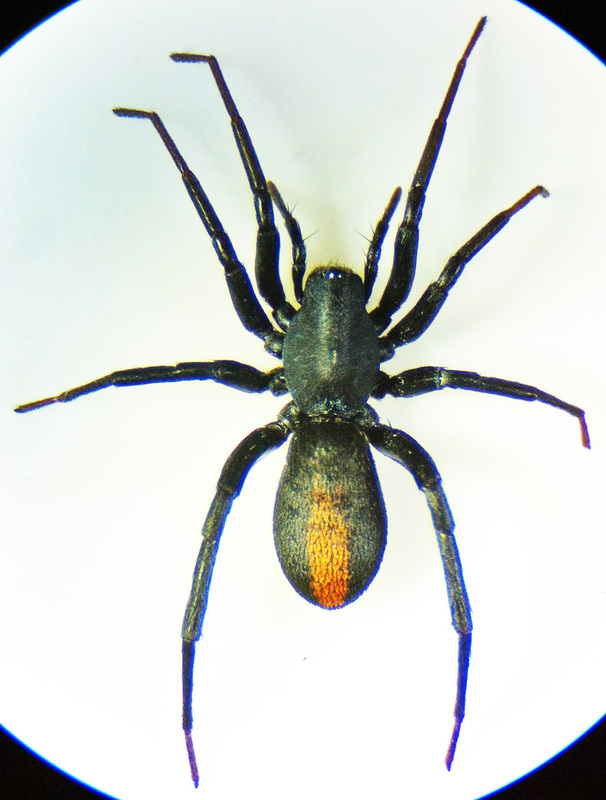 Hi, Joellyn: the red-spotted antmimic spider is relatively common. Chances are it is what you saw. Fascinating account. Thanks. Chances are it was the red-spotted antmimic, as they are relatively common. and i have a pic of a spider that closely re-sample your spider. i need to identify if it is poisoness. Hi, Shantelle: attach the pic of your spider and I will have a look at it.